I love music photography books and I enjoy ground floor opportunities. Jay Blakesberg is my favorite rock/jam photographer on the music scene today. He continuously captures with his lens the excitement and passion of live performance in the music of our heart. I just saw that Jay has a Kickstarter project for a new coffee table book, Jam. The premise of this title which will be Jay’s sixth music photography book is epic, live, magical music moments. If the sample pictures on the Kickstarter project are any sign of the vibrancy it will be a great publication. I decided todayI am going to back Jay’s next book because I believe in his art and energy, a lot. 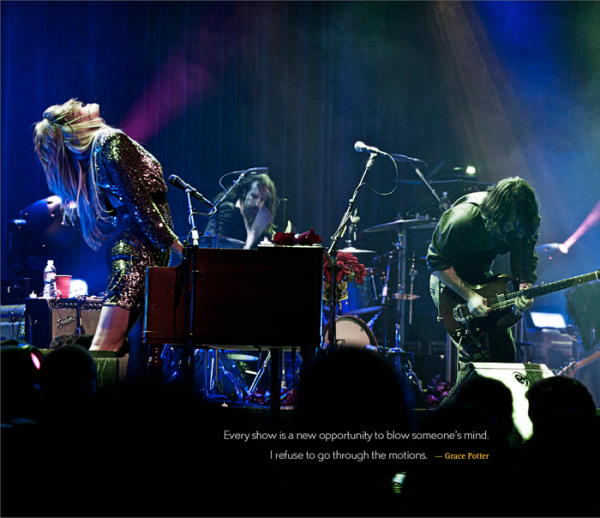 I have seen Grace Potter and the Nocturnals several times live and his photo exhibits how their concerts feel live.